Provided an overview of the diversity working group and recent town hall on the new efforts targeted at closing the achievement gap at Brent ES. The parent-driven working group started as a way to address concerns around the racial dynamics and inequities at the school. The group determined that an initial focus would be on closing the achievement gap by starting targeted supplemental tutoring for students most in need of academic support. The program required resources to pay tutors and for other supports from the overall PTA budget. Brent raises about $300K per year so the program leads needed to convey the importance of this program to the whole school in order to get PTA buy-in. They named the program “Rising Tides” to convey that an investment in a smaller group of students would help the entire student body. The PTA did choose to provide support for the tutoring program by funding some outside staff; some internal staff are paid by DCPS through administrative premium. They relaxed the definition of the achievement gap so the net could be cast more broadly, but the program still turned out to serve 100 percent African-American students. The program is all voluntary, but five teachers rotate through and one teacher provides the coordination. The program runs on T, W, Th with 16-20 students gaining additional instructional time in their days. The first hour is reviewing academic support work and the second hour is focused on structured play and whole child support. They provide homework support (plus snacks) focused primarily on math support. While it is early to see all of the results, the students participating are engaged and responding well. Parental engagement in the tutoring program— Realize that parental involvement is critical to the success of the program and Brent is still struggling to engage parents. They want to work on some additional ideas for doing so this Spring. Although the initial goal was to address concerns around poor racial dynamics, the program has done little o really bring the community out in support and underlying racial divisions persist. The Brent town hall meeting was not well attended by Brent families, an indication that support/enthusiasm is generally not high. Received an update on the city’s Master Facilitations Planning (MFP) process and changes that may impact Ward 6. With the PACE (Planning Actively for Comprehensive Education facilities Amendment Act), the Council Ed Committee tasked the deputy mayor for education (DME) with developing a longterm MFP for all publicly funded schools in DC. In the past, the Capital Improvement Plan (CIP) was often ad hoc and fluid, and schools that were in the plan did not always stay in the plan because it was very political. The Ed Committee’s plan for how to do the CIP using data and criteria has helped, and is an improvement to how the CIP was handled in the past. The MFP is behind schedule, but this is not unusual. The PACE Act originally called for it to finished in March 2018 with a budget, but it is now scheduled for completion in June 2018. The MFP scope is ambitious and requires substantial community input, which takes time. The city has not yet selected a contractor. DME’s guidance memo to LEAs requests charter participation and promises nondisclosure of charter data since the charter sector is autonomous. This makes cross sector planning difficult and the Cross-Sector Task Force has had a hard time establishing a coordinated planning process. Ward and feeder-based planning is a foundational piece of the MFP. Local knowledge is crucial, especially within the complex sector landscape. Ward 6’s 2010 initiative with middle school planning was an example for Wards 1, 5, and 7. Also pertinent to Ward 6 is that a new PCSB report identifies it as a “green zone” where prospective/expanding charter schools are encouraged to consider opening new charter schools. Discussion about how the overpopulating in Ward 3 schools and lobbying for expansions impacts the planning process across the city. Concern that the context of “providing more accessibility to higher performing schools” is framing the process and not better utilization of buildings and pushing quality across the city. Discussion about Miner historic building as one on the list of “vacant but on an active school site,” and interest in exploring ways to ensure the building is utilized to support the community rather than make it into an excess building. Also, raised the importance of maintaining green space even when schools undergo renovations. Decision to draft a sign-on letter from CHPSPO to invite DCPS and DME to plan with us as they committed to doing. Plan to share the CHPSPO letter with other Ward-based educational councils to see if there is interest in a city-wide letter. Discussed a proposal to conduct a half-day retreat in an effort to create a strategic plan for CHPSPO. The purpose is to level set knowledge in the group given the influx of new members, leverage new energy and excitement, and collectively identify future goals and objectives over the next few years. Also, interest in thinking more about how to recognize 15 years of CHPSPO (in 2021) and how to market and celebrate it. All agreed it would be a great opportunity to do so on a weekend afternoon with potential timing set in late January. If you are interested in helping to plan the retreat, contact Danica or Suzy. April 23, 2014 – 6:30 p.m. – 8 p.m.
Bike to School Day is Wednesday, May7. Lincoln Park event is on (7:30-8:30AM)! o How to get more low income families to participate? o WABA Bicycle Ambassadors to direct bike trains? o Golden Bicycle Competition – school w/ greatest percentage of cycling (and skating, scooting, tricycling) population in DC wins! o Law requires funds for field trips, uniforms, transportation, etc: application of the law depends on the school’s ability: schools automatically enroll homeless children. o Next Steps: Cornelia Sigworth to assemble homeless families sub-committee to pursue support activities. Reinforcement that the 3 policy examples are not binding. There are still opportunities to provide input and shape the policy. 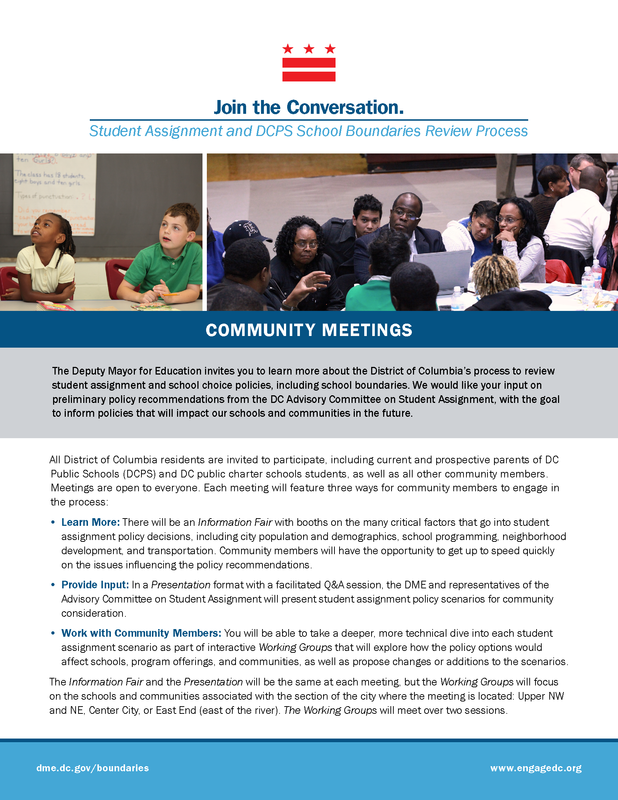 o You can provide feedback on the proposals on http://ourdcschools.org/ (created by Code for DC) through mid-May. All feedback will be made open, while protecting privacy data. April 26 DCYOP @ Eliot-Hine. 12:30pm performance on the blacktop. Stay tuned for the Fall 2014 DCYOP Petting Zoo at Eliot-Hine! May 7 Bike to School Day (Lincoln Park) – Register your school and join the Fun! May 14 Eliot-Hine PTO meeting for incoming families. How to get involved w/ PTO before you enroll. * School choice and student assignment policies establish the access rights that students have to public schools in the District of Columbia. School choice and student assignment policies determine who gets to go to which school, where and how parents and students apply to school, what rights students have to remain in a school they have chosen, and what rights students have to transfer between schools. 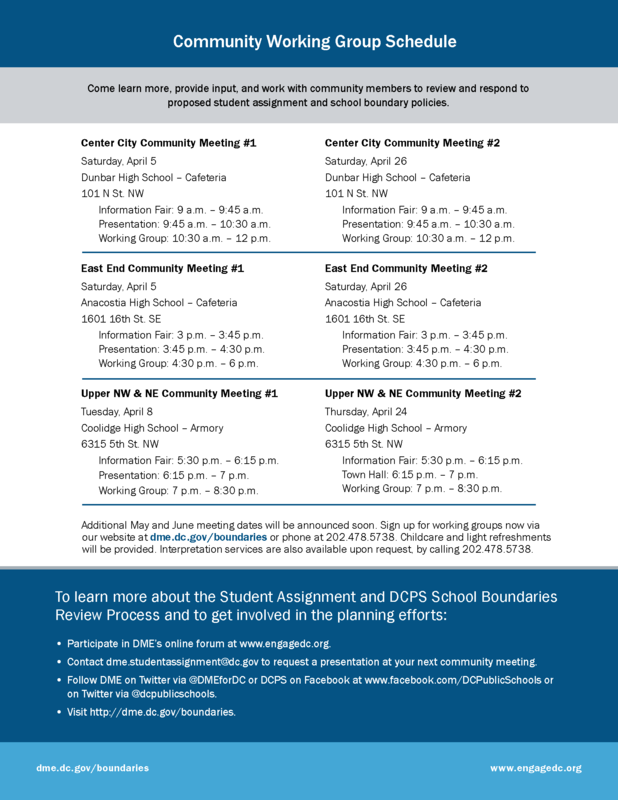 More information and materials from the DME on the Boundaries and Feeder Review Process here. – Q: What is working about your current in-boundary/in-feeder middle school? The communication to parents at Peabody and Watkins about activities at Stuart Hobson helps families become familiar with their middle school and starts to set the expectation that Stuart Hobson is going to be their middle school. Principal reaches out to all feeder schools to encourage participation with the middle school sports, events, etc. Want to maintain current feeder pattern to Stuart Hobson. Great local option supporting neighborhood schools and an established, reliable option for parents. Want to maintain current feeder pattern to Eliot-Hine and to Eastern. Seeing the progress around Eliot Hine and link w/ International Baccalaureate w/ Eastern and would like to see it continue. Families like the choice of being able to attend the Spanish Immersion program. Like that we live on Capitol Hill, and can still have choices in the neighborhood. Like Amidon-Bowen feeding into Jefferson. The school’s intention to keep cohorts together, beyond geographic boundary. Intent to keep neighborhoods together. 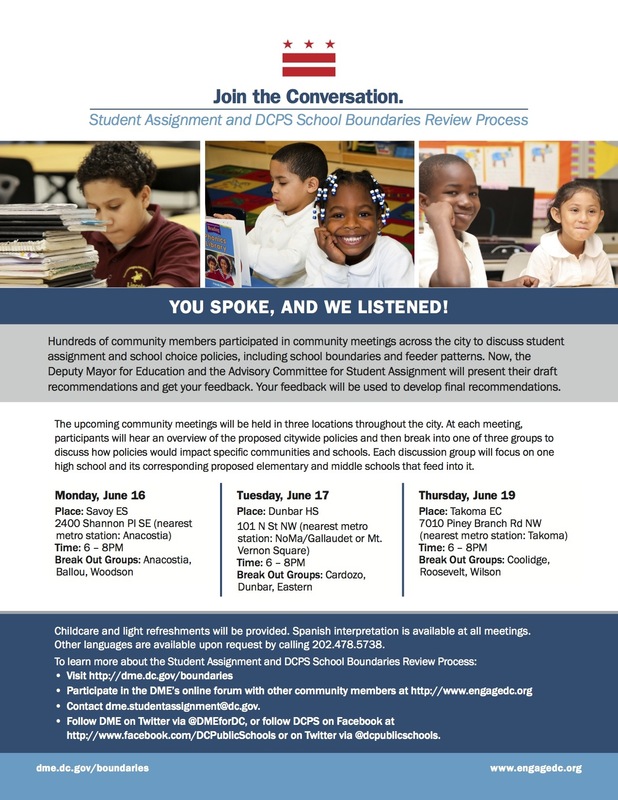 – Q: What is NOT working about your current in-boundary/in-feeder middle school? Boundaries for Watkins don’t match the size of the school. Charters like Washington Latin are pulling most advanced students. If DCPS MS doesn’t offer advanced courses, it’s tough to keep the advanced students. At Ludlow Taylor, students are not leaving at 5th grade, because parents see a clear path to Stuart. However, there is no connection with Eastern. Instructional Superintendents structure does not support vertical integration of programming or collaboration among schools within a feeder pattern. The Ward 6 Middle school plan that DCPS approved has not been supported nor adequately funded. Capital/facility improvements have come about too slowly. It is a struggle by the school and community to get DC to fund renovations. Too much choice in the system. Choice came about because system was not servicing schools. There isn’t thought about the capacity of a school vs. cachment as a feeder – needs to take charters into account when thinking about decisions around boundary/feeder. Currently, there is no strategy. No strategic planning between Charter and DCPS. (former Ward 5 parent) Ward 5 has shut down DCPS schools and many neighborhoods are being serviced by charters. Boundary discussion is an opportunity to ‘level playing field’ by introducing neighborhood preference and advocating for legislation that requires charters to take in-boundary students, regardless of time of year. Catania’s refusing to outsource MS to charters creates an opportunity. Boundary planning should happen w/ charters as part of discussion. There is intentional misalignment of middle schools starting at 5th grade. IB has been slow to get off the ground at Eliot-Hine, which hurt the implementation of the Ward 6 middle school plan. DCPS’ competitive advantage on middle schools should be a predictable feeder pattern and path for students. Charters seem to be doing a better job of operating as a system than DCPS. Charters seem to do a good job of showing the continuum of education among charter school feeder patterns. What values do we hold that we believe should influence school boundaries and feeder patterns, e.g., proximity, diversity, choice, predictability? What is our vision for school boundaries and successful feeder patterns, e.g., successful feeder patterns from elementary to middle to high schools? How do middle schools influence school boundaries and successful feeder patterns? How to ensure an open, collaborative and fair process for determining school boundaries and feeder patterns? Ideas for getting broad input from Ward 6 parents – survey?